Customer retention is a problem across college stores. Understanding how students feel about your store is an essential part of identifying the areas that with improvement can help you provide students with a better experience and increase satisfaction. Surveys give your store insight to what students think, their priorities and how you can better help them achieve success. But, how do you create a survey that is measurable, moves you closer to your goals and produces usable information? Surveys are an important tool in the college store's toolbox. They let us gauge customer satisfaction, help our students feel like they're being heard and give us valuable insight to what we're doing that's working, and what we could change. So why not make your surveys easier to build, and better looking? It's the busiest time of year. Why not take a break, if only for 2 minutes or less? Surveys are an important tool in many bookstores' toolbox. They provide direct feedback and an opportunity for your customers to be honest with you about your services and what they want. What Did You Think of Bookstores without Barriers? Did you see our recent webinar series? Did you NOT see it? What did you think? The world of retail is becoming more competitive each and every day. In order to gain more sales and satisfy your customers, you first need to know what it is they want. It's impossible to offer a better experience without knowing what your students think about the way you're doing things now. You might be surprised what you learn, too. The best part is, it's as easy as asking. The following excerpt is from the article Ten Golden Rules for Providing Successful Customer Service, with our own suggestions added in. Read the full article for more ideas on how to better serve your students. Marymount University Enlists Students as "Mystery Shoppers"
The following article was written by Kevin Kiley for InsideHigherEd.com and offers a great example of your store and/or campus can improve upon customer service by enlisting the help of students. The following article, 4 Simple Ways to Find Out What Your Customers Really Think, was written by Rieva Lesonsky, CEO/President of GrowBiz Media, for the AMEX Open Forum. View the article here. It turns out there’s a really simple way to cement customer loyalty—ask them what they think. In a recent survey from Cint, 62 percent of consumers say they would be more likely to purchase a brand’s product if the company asked for their opinions. And more than half say they’d be more loyal to the brand as a result. 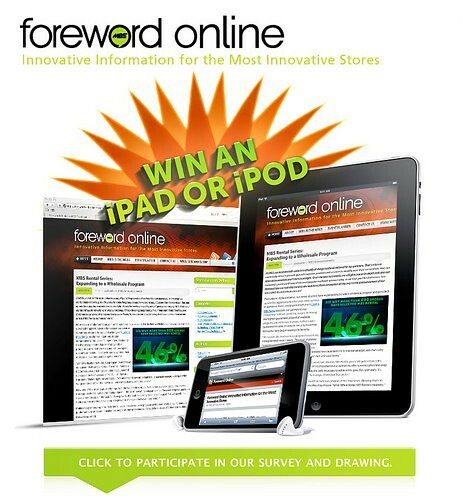 Provide Your Feedback for a Chance to Win an iPad 2 or iPod Touch! Foreword Online has been live for a month, and we want to know what you think! Our goal is to connect you to the latest industry-relevant information and ultimately make your job easier – however, we need your help to make this goal a reality.